Illustration: Gerrie Congdon. Sunset Composition, 2009. 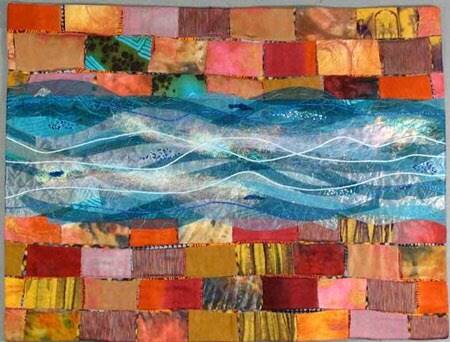 The textile artist Gerrie Congdon produces work that deals with the elemental landscape. The natural world is such a large part of Congdon's compositions that they set both the scene and the style of each piece. Her work forms a collage of experiences all of which are of the quiet, thoughtful and reflective variety, the best type when observing and representing the natural world. Illustration: Gerrie Congdon. Illuminated Aspens, 2009. There is a definite element of tranquillity that permeates her work, almost bordering on that of a serene stillness. Congdon reveals through a combination of screen-printing, painting, stencilling and discharging, a series of colour tones and textures that are able to transport us to the quiet places of the natural world. These undisturbed and untroubled havens might well be areas that are tucked away in the memory or imagination of the artist, though it seems more likely to be a matter of compositional thoughts that are imbued with Congdon's love of the natural repose that she finds around her, and that we often find ourselves in forgotten and undisturbed corners of the natural world. Illustration: Gerrie Congdon. Red Sky, 2008. Congdon uses both hand dyed and painted fabrics as well as those produced commercially. However, this does not produce an unbalanced or disturbing composition, as all fabrics whether hand produced or bought, are carefully selected and placed within the parameters of the tonal quality that she has chosen for a specific composition. This produces a harmonious balance that places neither type of fabric in any form of conflict, which would in affect destroy any tranquil remoteness that Congdon wanted to achieve. Illustration: Gerrie Congdon. Sea of Salt, 2009. It is this remote tranquillity that is the beauty and strength of her work. These compositions are landscapes, but of a more removed, introspective and abstract temperament than that usually experienced with fully representational art. Through her observations she is able to permeate the natural world with an element of silent stillness, that of a clutch of trees on a still winter's day, or of a peaceful and placid cove, where the world has gone quiet and humanity is at bay, at least for a moment. Illustration: Gerrie Congdon. Breaking Barriers, 2007. Congdon's work deserves to be seen amid quiet reflection and that of an understanding of the stillness and unstirred elements that still remain within us, perhaps deeply buried to protect them from the world we live in, but still accessible if we wish. Gerrie Congdon has a comprehensive website, which can be found here. She also has a regularly updated blog where her work in progress can be followed, as well as having a Flickr account. The blog can be found here, while her Flickr account can be found here. All images were used with the permission of the artist. How wonderful to see Gerrie's work honored. Such a thoughtful discussion. Thanks. Thank you, John. This is lovely! Nice write up about Gerrie. Enjoyed seeing your selection of photos with your comments. Thank you for an insightful post. You've chosen many of my favorite pieces that Gerrie has created (including "Illuminated Aspens" made just for me). Thank you for sharing them with the world. It is refreshing to read a well-written piece on some remarkable art. Thanks to both of you. Beautiful work, beautiful words. Art makes the invisible, visible. Thank you Gerrie and John. i like that sea of salt. Thank you for all your comments and I am glad that you have all enjoyed Gerrie Congdon's work. The next textile artist in this series will be Pat Dolan. Anyway, I really like Gerrie's works. I have a hard time following (and thereby understanding) so much of the abstract art out there. Here I can even tell what type of tree the artist is depicting. I love it! Thank you so much, John, for introducing me to so many new fiber artists! I am really enjoying this! There is still a fairly long list of names of textile artists to get through, I hope they are patient. I am glad that you are enjoying the series J.R. I have no idea what footballers there are or their names, though it does make me smile to think of at least some of them attempting textile art, thanks for that! Some of these pieces put me in mind of David Hockney. I like these a lot. A very thoughtful, thought provoking review. Thank you. While I've always enjoyed Gerrie's work, I rarely focused on the quality of stillness so much as on her exhuberance and love of textile design and her ongoing experimentation while remaining faithful to her own sense of art. Thank you for your comment Pat, I only hope that I can do your work justice when I write the article which by my reckoning should be just after Christmas.